The Iowa State football team is honoring former Cyclone golfer, Celia Barquin Arozamena, at its game against Akron on Saturday. Arozamena, who won the Big 12 Championship in April and is considered one of the greatest women’s golfers in Iowa State history,was tragically killed earlier this week. The team is wearing helmet decals with Arozamena’s initials during their game against Akron. Akron followed suit, putting aside the competition, with helmet decals of their own. The former golfer, who was recently named Iowa State’s female athlete of the year, was previously scheduled to receive the award with a ceremony during the game. Instead, Arozamena was honored with a tribute video and moment of silence before kickoff. The team also announced halftime plans to award Arozamena a posthumous diploma with a bachelor’s degree in civil engineering. Previously this week, the university held a vigil memorial and created the “Remembering Celia Memorial Fund” directed to the golfer’s family to be used in her memory. 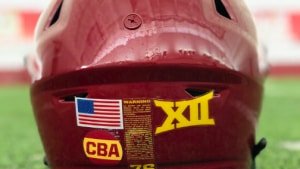 Iowa State’s football team isn’t the only one to rally around Arozamena’s memory this week. The women’s soccer team has named the outstanding athlete an honorary captain this season and will wear captain sleeves and patches in her memory for the remainder of the year. They also wrote “CBA” on their wrists for their game against TCU. The Cyclones volleyball team joined in memorial of Arozamena, taking a moment of silence to remember the golfer before their game against West Virginia this week. Iowa and Northern Iowa also planned to honor the instate athlete, making yellow, Arozamena’s favorite color, their primary color for their games today. Showing how much of an impact Arozamena had on the collegiate athletic community, teams across the country honored the former golfer in their own ways. The Kansas State and Texas volleyball teams wore yellow ribbons, Michigan golf pinned ribbons to their hats, Arizona State golf pinned ribbons to their bags for the rest of the season, and Baylor turned all 19 athletic teams cardinal and gold this week. The California and NC State women’s golf teams also wore ribbons in her memory. The Ladies European Tour held a moment of silence for Arozamena. There’s no doubt Iowa State will hold a special place in its hearts for Arozamena and will continue to honor her memory.